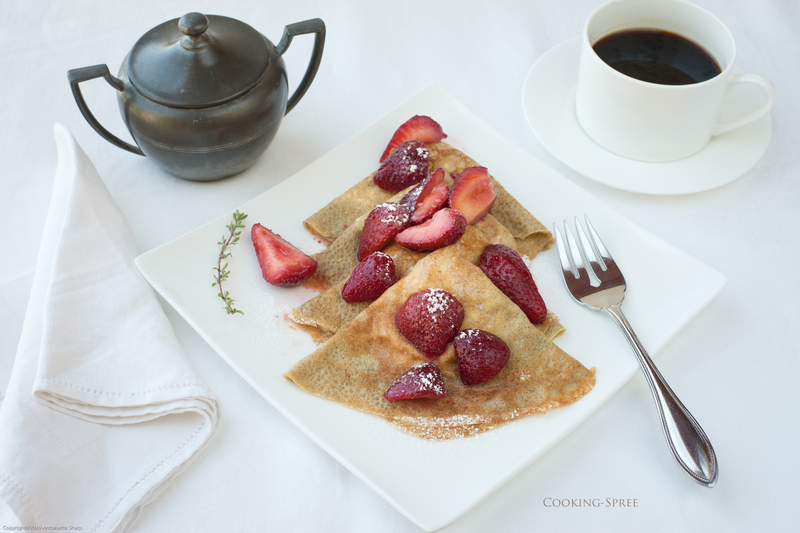 When I was a newly-married, very young and inexperienced cook, I decided to make crêpes for my mother’s birthday. Bold move! I’m not sure if I’d ever even eaten a crêpe before, but I’d surely seen them, and knew I’d adore them if given the chance. So I turned to Julia Childs (one of only three cookbooks I had at the time.) Her fully-detailed recipe and the accompanying illustrations gave me all the assurance I needed. The next day, voila! savory chicken crêpes for dinner! And they were a huge hit, talked about for years in our family! I’m thinking that the memory of those crêpes far exceeded their deliciousness, but that’s what happens when the telling of anything gets all wrapped up with love. There was nothing wrong with that crêpe recipe, in fact it was good, but I’ve found one better. Chef Alice Waters, after spending years in Paris, once thought of opening her own crêperie. Friends prevailed on her though and eventually she opened Chez Panisse, the now-famous restaurant in Berkeley, instead. Still, her long-time love of crêpes is evident in every tender bite of these delicate little pancakes. You’ll taste it, I promise. Here I’ve filled them with whole-milk yogurt (or substitute sour cream) and ladled on strawberries, sweetened and bathed in Grand Marnier. We have a couple family birthdays this weekend and this will be a treat worthy of the occasion. Breakfast or dessert? Must we choose? Once the butter has melted, remove the pan from the heat and cool. Cover the bowl with plastic and refrigerate overnight. Remove from the refrigerator one hour before frying. With a moistened cloth or paper towel dipped in vegetable oil, lightly grease a 6- to 8-inch fry pan (with shallow, sloping sides). Put the pan over medium heat. Using a small ladle or large spoon, pour in about 2 tablespoons of batter. Tilt and rotate the pan quickly, spreading the batter out to cover the bottom of the pan evenly. Cook until brown, just a minute or two. Lifting one corner of the crêpe with a very thin spatula or a butter knife, pick the crêpe up with your fingers and flip it over. Cook briefly on the other side, no more than a minute. (As with other pancakes, you can consider your first two or three to be trials. I should add that the buckwheat will continually drift to the bottom of your bowl, so give the batter a stir each time you ladle new batter out.) You can stack the crêpes on a plate as you go, covering with a tea towel. Just before serving, spoon in the desired filling, fold crêpes in fourths like little handkerchiefs, and put them in a hot oven for just a few minutes. Then spoon on the topping of your choice and dust with a sprinkling of sugar. These are also tasty with good jam or marmalade folded inside, topped with either sour cream (that’s been thinned with a bit with cream), or crème frâiche, then dusted with confectioners’ sugar. Wash and hull the strawberries. Cut in half or fourths (or smaller, depending on the size of your berries). In a bowl, stir first the Grand Marnier, sugar, lemon juice, jam and zest. Then add strawberries and mix all ingredients together. Allow them to sit for at least thirty minutes before serving in order to draw the juices from the berries and for all flavors to blend. 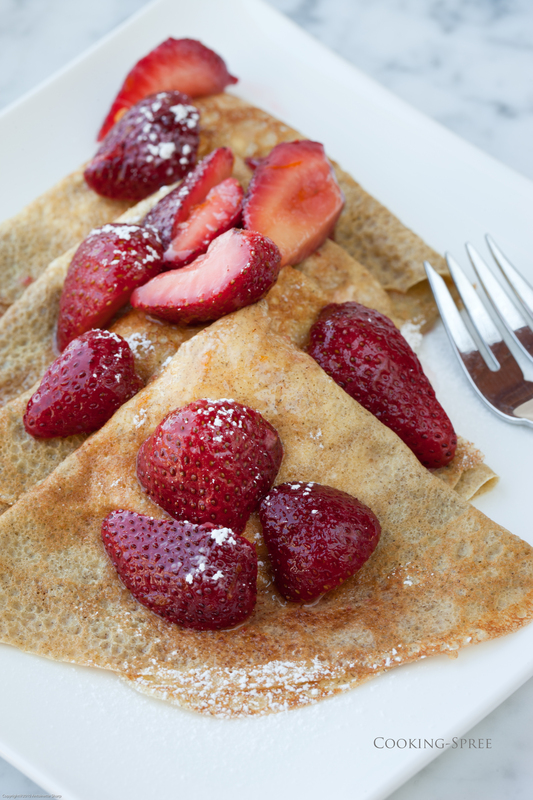 To serve with crêpes, fill each with about a tablespoon of whole-milk yogurt or sour cream, fold into quarters, spreading the filling slightly out from the center. Stagger-stack on a plate and spoon strawberry compote over top. Dust with sugar. For a printer-friendly version of these recipes, click here. Yummy! Love these! HAPPY BIRTHDAY TO YOU, MAMA (and sweet little Lukey, too)! If I were breakfast, I would want to be a crepe. These look elegant and simple. But now I am full of questions. Is there a non-alcoholic flavoring you would recommend for the strawberries? Where did you get those luscious looking berries? And can crepes be easily frozen? My computer can do a lot of things. Right now I wish I could click an icon and have those crepes served up! Oh Caralina the ballerina crepe! 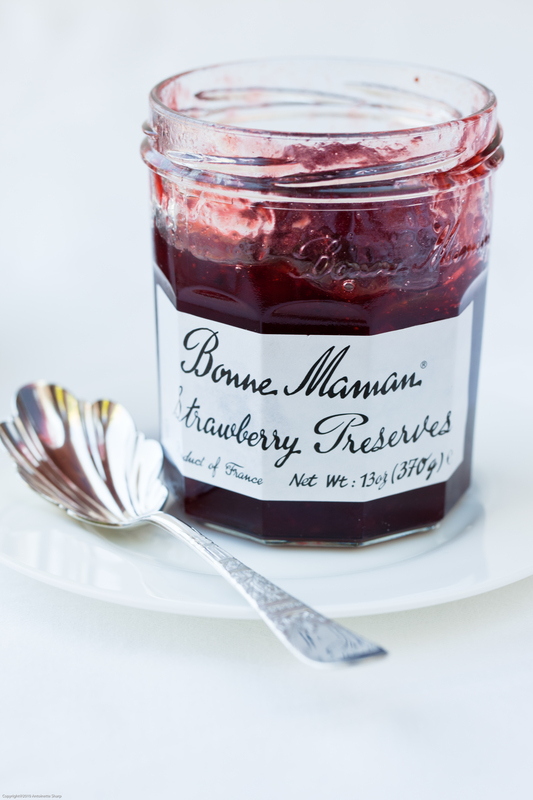 Answers to your questions : I’d sweeten the berries a little (with whatever you like to use) and let them sit to draw out some of their juices; add a little zest of lemon or orange and a squeeze of that fresh juice; a little good strawberry jam or a few mashed berries to thicken it all up a bit. Ladle on! Where did I get the berries? I’ve been bragging so much on Oregon berries, but I really owe a debt to California this Spring. Oregon’s are still weeks away and we’ve had some good California strawberries a couple times this month. These organic ones from Market of Choice. Crepes freeze very well! Just put little squares of wax paper between them, wrap them all up in an airtight freezer bag. No one will know. Thank you for the satisfying replies!